Both the sauce and the parmesan can be made in advance, so putting these together will take just a few moments. As an alternative, chop all of the vegetables and roast them, then toss them with penne, the pizza sauce, and the almond parmesan for a deconstructed version. To make the pizza sauce, put all of the ingredients in a medium saucepan. Bring to medium heat and let cook 10 minutes. Remove from heat and let stand while preparing the other ingredients. This can be made in advance and the flavor improves as it stands. To prepare the portabellos, preheat the oven to 425. Line a 9×13 pan with aluminum foil. Use a moist paper towel to wipe the portabellos clean, then use a fork to scrape out the gills. Put in the pan and sprinkle with salt and pepper. Bake 10 minutes until almost tender, then flip and bake an additional 10 to 15 minutes longer until cooked all the way through. Remove from the pan and let drain on paper towels. Drain any excess liquid from the pan. To make the almond parmesan, put all of the ingredients in the food processor. Pulse until the mixture is finely ground. You’ll use about half of the mixture in this recipe; store leftovers in an airtight container in the refrigerator. After the portabellos are drained, put them back in the pan. Spread pizza sauce inside each one (depending on the size of your portabellos, you might have leftover sauce. 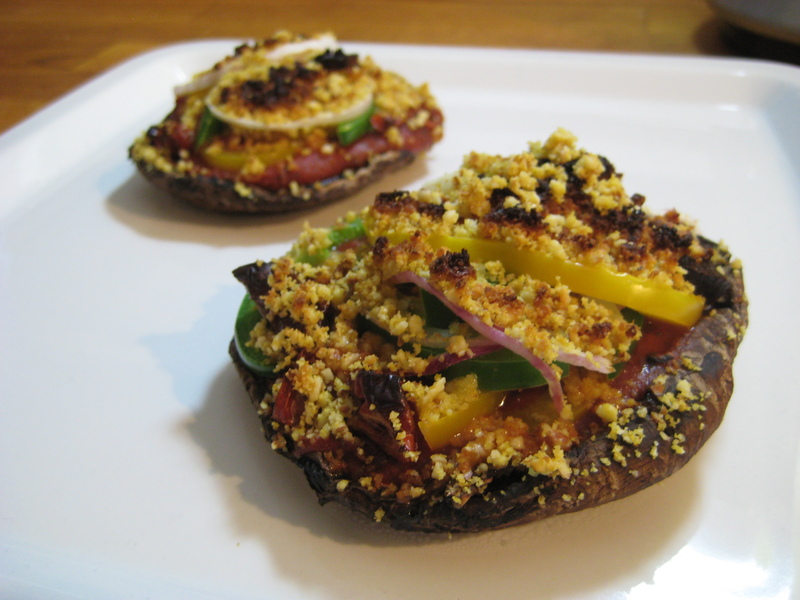 You can refrigerator or freeze it or use extra for dipping the mushrooms in). Top with the peppers, onion, and sundried tomatoes, or your other favorite toppings. Sprinkle generously with the almond parmesan cheese. Return to the oven and bake until toppings are cooked through, about 10 minutes. Serve warm. I attended your allergy-free presentation at the main library on Feb. 16th. I was drawn to your presentation by seeing gluten-free. I have just visited your websites and am very pleased to see recipes with vegetables, which is my main focus at this time. I was very impressed with what you presented and your accomplishments in the allergy-free domain. Thank you for sharing! You had mentioned your quest to follow up on locations focusing on allergy-free products. One I have frequented is Grand Oak on Victoria Ave., Vineland. Chef Jan-Willem Stulp and his wife have opened this location this past April. Thanks for attending the talk! I was unaware of Grand Oak and I am definitely going to check it out. I appreciate you letting me know! I found their website and have bookmarked it (it says it is Coming Soon). I am going to have to make my way up there.